2019 is the Year of the Boar, the twelfth sign of the zodiac. The tearoom in early January is a marvelous environment. Auspicious decorations accompany these gatherings that reflect the zodiac sign of the boar and the emperor’s poetic theme, 光 (hikari, light). Please join us to welcome the New Year together in the tearoom. RSVP: Open to full-time students of the Foundation. Reservations are necessary. TIME: 2 p.m. & 5 p.m.
RSVP: Reservations are necessary and must be secured with a check. Please telephone 415.433.6553 or email contact@urasenke.org for further information. RSVP by January 4 to reserve your seat. RSVP: Reservations are necessary and must be secured with a check. The fee is $35 for members, $40 for non-members. Please call 415.433.6553 or email contact@urasenke.org to reserve your seat. 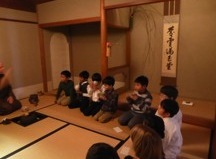 To promote a deeper understanding of Japan in the local community, the Consulate General of Japan in San Francisco has invited the Urasenke Foundation San Francisco to present its 2019 Way of Tea Program. Each gathering will cover the history and practice of the Way of Tea through hands-on participation. The Way of Tea will be discussed in terms relevant to the class topic for each group that attends. The program is open to school groups from elementary through college level. More information about the program may be found on the Consulate-General's site.